Weather data and information from roadside ice-detection systems are the basis for predictive road-condition services. As more vehicles become connected, vehicle data will enhance the service. Service enhances safety and availability of automated driving functions. Bosch road-condition services to be rolled out widely from 2020. Stuttgart, Germany – Haptic sensation when driving is something that shouldn’t be underestimated. What condition is the road in, how well are the tires gripping? Having or developing a feeling for this can help drivers handle their cars appropriately and safely. Race drivers already have a word for it: seat-of-the-pants feel. They mean the contact between the seat of their pants and their driving seat, which allows them to feel the state of the road surface. Automated vehicles also urgently need information about road conditions. Unfortunately, however, they don’t have any feeling for such conditions – or haven’t up to now. Bosch has developed a system that gives automated vehicles seat-of-the-pants feel. “Wet roads, snow, ice – with our predictive road-condition services, we alert to hazards before critical situations can develop. We are helped here by the weather data provided by our partner Foreca. This means an automated vehicle will know exactly where it can drive autonomously, and how,” says the Bosch management board member Dr. Dirk Hoheisel. With our predictive road-condition services, we alert to hazards before critical situations can develop. Foreca is one of the world’s leading providers of weather information, with two decades of experience in predicting road weather conditions. “Combining the expertise of Foreca and Bosch will lead to a new era of road-condition forecasting. Unlike weather forecasts in the media, the Bosch road-condition services take multiple possible forecast scenarios into consideration,” says Petri Marjava, Foreca’s sales director. The road-condition services boost driving safety and smoothness. In addition, the availability of automated driving functions is increased. The Bosch services package is to be rolled out worldwide in 2020, initially on the basis of weather data. As more and more connected cars appear on the roads, the service will be augmented by vehicle data. Up to the highly automated SAE level 4, the decision as to whether a car can assume the task of driving depends on factors such as road type, speed range, and environmental conditions. In future automated vehicles, this decision will also be based on the predictive road-condition services provided by Bosch. Thanks to their help, the automated vehicle will know in good time what environmental conditions to expect. This means it will have plenty of time to adapt its driving style, instead of having to hand over the driving task to the driver at the first sign of impaired road conditions, however minor. 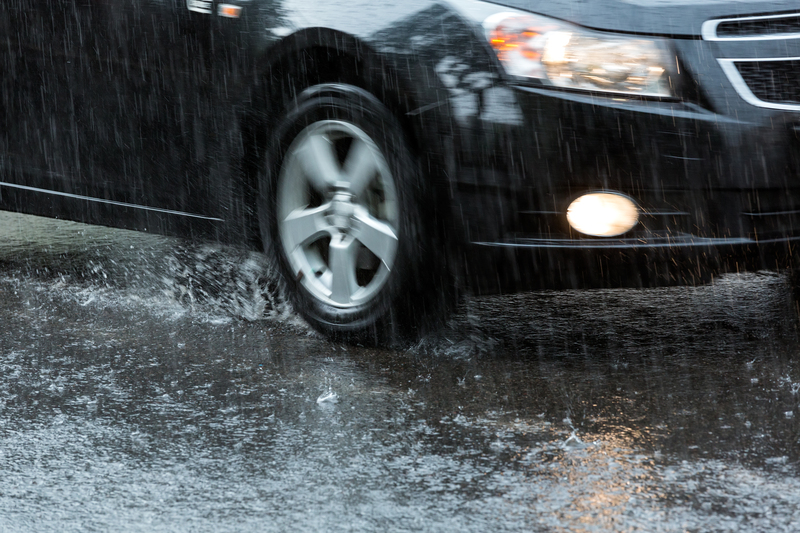 If the vehicle’s route takes it through rain, it will adapt its speed well in advance to a level that excludes any risk of aquaplaning and allows it to stop safely at any time. 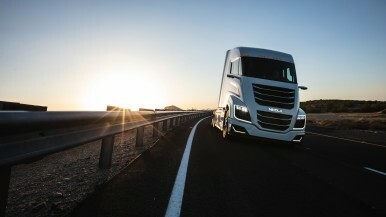 Whatever the SAE automation level, the result is a safe drive that is also smooth and comfortable. 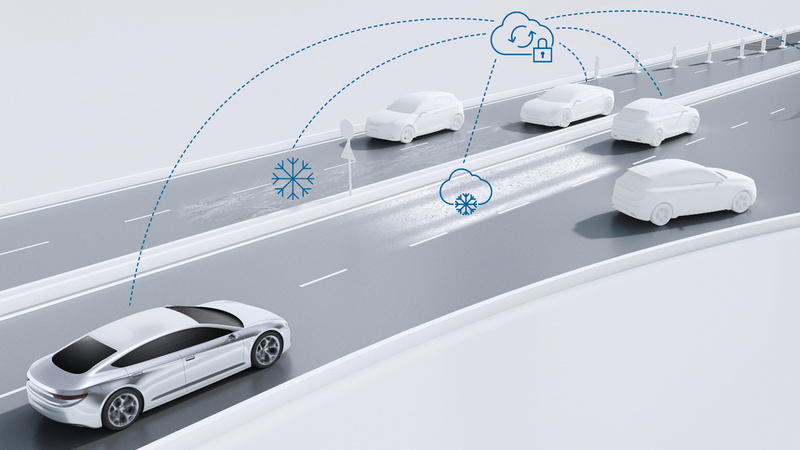 For its predictive road-condition services, Bosch is relying on a multiphase concept. 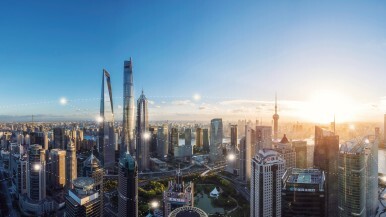 By the time of its planned launch in 2020, it cannot be expected that there will be a sufficiently large proportion of connected vehicles on the roads. 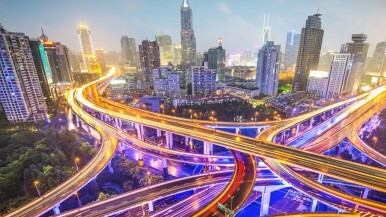 Bosch estimates it would take some 20 million connected cars to cover the roughly 80,000 kilometers of freeway in Europe alone. For this reason, road-weather forecasts will initially be the only reliable source of information for drawing sound conclusions about road conditions, especially in rural areas where there is less traffic. Bosch will get the constantly updated global road-weather data it needs for this from Foreca. Bosch’s thorough examination of several leading providers showed that the Finnish weather experts were the most accurate road-weather data provider globally. The more precisely hazardous conditions can be predicted and localized, the easier it will be to keep the availability of automated driving functions to a maximum. Thanks to a worldwide reference measuring fleet and machine learning methods, Bosch and Foreca have jointly been able to optimize the safety and availability of the road-weather models. In this way, the two companies have achieved a safety standard of the kind that will be necessary for life-critical systems such as automated driving. As a sufficient number of connected vehicles take to the roads, Bosch will supplement its predictive road-condition services with vehicle data. These data will include information stored on the CAN bus, the vehicle’s central data network, such as the temperatures measured inside and outside the vehicle, and whether the windshield wipers are in use. Thanks to connectivity, this data will not remain unused in the vehicle, but will find its way into the Bosch cloud via the respective automaker’s back-end server. In addition, Bosch will evaluate the regular interventions by the ESP anti-skid system. Using mathematical methods, engineers can measure the friction coefficient of the road surface at each individual wheel, as well as the status of each wheel. When all these data are combined and intelligently evaluated, the result is a package of smart Bosch services – and the comforting feeling of being in safe hands.